Our home, just like a boutique hotel in Florence centre, a noble ancient residence in the heart of the Santo Spirito’s district. Casa Botticelli represents Tuscany seen and lived with the eyes of those born and grew up, exactly here. On the first floor of a fifteenth-century building in Oltrarno, a charming house reveals the romantic marriage between past and present, narrating the stories of those who lived here, recalling the tradition of antiquarians of the Botticelli family enhancing surprising works of art on display and on sale. Among vintage and modern design, our natural inclination to welcome guests and friends. Bruno and Eleonora Botticelli lived here, here she played the same piano you could see in the common area (Bach and Schumann were there favorites), they started their first collections, getting involved int he Florentine life and culture, appreciating the blossoming of new talents and friendships. Their family also hosted many people during the Christmas night. No wonder that their home is today the ideal location for an unusual holiday of pure charm, a destination for a lovely weekend or even a stage for a formal business meeting. Booking your room and sleeping here is much more than staying in Florence centre, it means taking part in a story, playing a chapter in a long book composed of men, lives and anecdotes. At your arrival, you will find Eleonora, the owner, and her staff. You will appreciate the alternative style designing every single bedroom, making each one different from the others: as in a boutique hotel, details define luxury settings, where contemporary comfort is combined with classic and medieval elements, creating new opportunities for pleasure. Nearby Palazzo Pitti, the most modern, innovative and familiar concept of hospitality in entire Italy, the sensual mix of relaxation and authenticity for an unforgettable stay, a secret escape characterized by artistic and evocative suggestions. 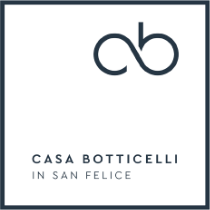 Casa Botticelli, the art of hospitality, a gallery of emotions.